Metastases are the result of a complex process through which malignant cells become subject of detachment from the primary tumor followed by spread at distant sites. As it was reported over the time, the vast majority of cancer- related deaths are caused by metastasis. Therefore, the clinical attitude is dictated by the existence/absence of metastatic masses and by the need to prevent the systemic dissemination of malignant cells. The process is initiated by a sequence of events generally known as invasion-metastasis cascade. Moreover, progression has been demonstrated to rely on permanently newly acquired mutations. The metastatic sub-clone invades the local extracellular matrix, next entering the blood or lymph vessels. It circulates as an embolus and following extravasation, it follows the path from formation of micro-metastasis to generation of macro-metastatic mass using extensive growth process [1, 2]. The limited existing treatment strategies aim to prevent metastatic disease or to reverse it. They entail identifying novel molecular targets and drugs, generating methods to deliver pre-existing substances, or joining resources to administer personalized treatment. At the current time there is a large spectrum of drugs that can be administered in cancer treatment, the main pitfall is to obtain selectively killing all the malign cells with no harmful effects on healthy cells. Biofunctionalized nanoparticles loaded with drugs can be tailored to overcome these biological barriers and to improve efficacy while reducing morbidity . Nanotechnology represents a broad field with an exponential growth, holding of the immense potential in cancer treatment. The intense on-going worldwide research is mainly focusing on targeting cancer cells using nano-sized particles. Conceptually, a highly sensitive nano-biomolecule consists in a responsive nanoparticle that has attached a delivery carrier with affinity for unique surface receptor proteins located inside the cellular wall . In this way, the carrier is able to concentrate the desired active molecule only in the desired tissue. This process of specific accumulation of active drugs inside tissues or organs is not possible under normal conditions. Therefore, the development of these multi-modal nanoparticles holds tremendous potential for future cancer treatment. This ability for nanoparticles to accumulate in large concentrations in targeted tissues or cells may be accomplished through either one or both means of targeting: passive or active. In passive targeting, the nanoparticle is directed in the desired cell or tissue via blood flow. To function as passive targets and to last systemically for longer periods of time nanoparticles must be between 10 and 100 nanometers in size . The effects of passive targeting may be enhanced by using drug-loaded nanoparticles to obtain high selectivity to a target tissue or cell. This process is termed active targeting. The diversity in the usage of nano-structure materials results from their versatility in functionalization. The possibility of binding a wide variety of molecules tailored according to the properties of the target makes them a promising treatment tool. However, two factors are considered to be the key elements which lead to consequently distinct results of functionalized nanostructures. On one hand, attaching a new molecule onto the surface of the nanocomposites is responsible for increasing selectivity and specificity of the proposed methods. On the other hand, variation of the moiety to be attached induces variation of the practical approach involved, and therefore toxicity might vary with the synthesis protocol . However, there is still limited knowledge about effects of long-term administration of nanocarriers. There are concerns regarding the effect of nanotechnology-based treatment solutions as promoter of the metastatic process. Following exposure of tumor cells to nanoparticles as therapy strategy for non-metastatic disease, the fate of the few residual malignant cells should be considered of utmost importance. The question on whether the presence of nano-sized structures has the potential to promote modification in the structure of the molecular target (e.g receptor), distinct aberrant pathway activation (e.g alteration of apoptosis)  or adherence and stability impairment still needs to be fully answered. The consequences of this undesired effect could be represented by multidrug resistance and metastasis induction. Moreover, the effect of long-term exposure of healthy cells to nano-agents should also be addressed in sustained investigations. There is an increasing interest in the side effects of modern approaches, aiming to establish proper concentration, dimension and route of administration of the nanomaterial. Underlying the tumoral cell dissemination, there is an overwrought process which is intensely scrutinized worldwide and provides several pharmacologic targets. The invasion-metastasis cascade must be analyzed from its early beginning, when tumor cell undergoes local invasion. Epithelial-derived cancer cells are known to exhibit movement capacity as individual cells (mesenchymal or amoeboidal) or collectively (sheets or clusters), having the potential to switch between these phenotypes by epithelial-mesenchymal transition (EMT), collective to amoeboid transition (CAT) and mesenchymal to amoeboid transition (MAT) [8, 9, 10]. EMT has an intricate background and was first documented due to its contribution in embryogenesis. It has also been demonstrated to play notable role in chronic inflammation, tissue fibrosis and wound healing . However, the dreadful contribution of EMT is linked to tumoral invasiveness and metastasis. EMT is the sequence through which epithelial cells lose their polarity and adhesiveness and gain mesenchymal phenotype, thus acquiring migratory features. It was also revealed that EMT is responsible for generation of cancer stem cells and stem-like cells and thus explaining cancer recurrence and part of drug resistance mechanism . 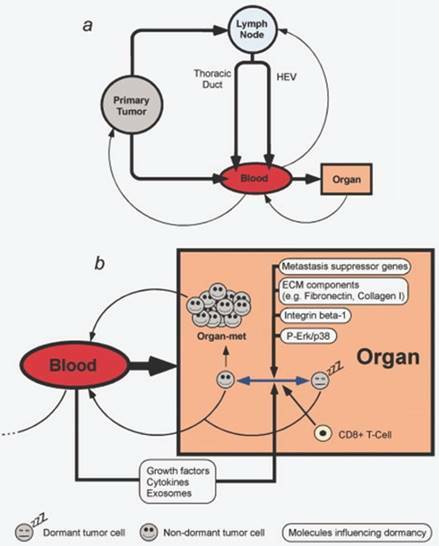 Therefore, acting in the early steps of metastasis by blocking EMT may stop systemic dissemination of tumor cells. Also, in already present metastases, such an intervention could improve sensibility to chemotherapy. The hallmark of EMT is represented by cadherin switch. E-cadherin down-regulation , resulting in epithelial cell adhesiveness loss, inciting not just the detachment from the tumor cluster, but also promoting intracellular rearrangements. The reshuffling is secondary to the loss of function of catenins α, β-and p120. E-cadherin expression is suppressed by some transcription factors like- Snail/ Slug, SIP1/ZEB2, Twist, , . Thereby, we may hypothesize that restoring E-cadherin function may be useful to stabilize tumor cells. Several targets have been underlined for their function to initiate EMT: transforming growth factor β (TGFβ), fibroblast growth factor (FGF), hepatocyte growth factor (HGF), vascular endothelial growth factor (VEGF), platelet derived growth factor (PDGF), epidermal growth factor (EGF), Notch pathway (Figure 1) [16, 17, 18, 19]. Signaling pathways responsible for down-regulation of epithelial genes and up-regulation of mesenchymal genes and inducement of EMT. Reproduced after Roche, et al, 2007, with permission . Cancer associated fibroblasts (CAF) represent the majority of cells found into the tumor stroma and are exerting complex interactions with malignant epithelial cells by directly or indirectly interactions . Through the vast constellation of cytokines and growth factor secreted, the cells are involved in a multitude of signaling pathways and are coordinating several molecular cascades involved in tumoral progression and metastasis, such as epithelial-mesenchymal transition, angiogenesis and abnormality of apoptosis . The complexity of signaling processes involved in pancreatic cancer was also illustrated by Gaianigo et al (Figure 2) . We may assert that CAF are situated in the centre of metastatic process and dictate the main trend of tumorigenesis. Thus, restoring normal homeostasis may be achieved by either removing CAF, inhibiting their development, or by blocking the signaling pathways regulated . It has been recently reported that CAF are able to induce EMT in prostate cancer cells. The link between the two type of cells was found to be interleukin 6, secreted by carcinoma cells, which led to fibroblast activation . Targeting CAF has been reached by taxane nanoparticles and proved highly effective approach, by decreasing the tumoral mass and inhibit metastasis formation in pancreatic cancer mouse model . Restoring epithelial homeostasis requires multi-targeted strategies, as suggested by Navarro P et al. who reported that restoring E or P-Cadherin function is not enough to stabilize epithelial cells in spindle cell carcinoma. By allowing multiple functionalization of various nanostructures, making multi-directional targeting possible, nanotechnology may find its contribution as a feasible approach. Recently, Watson KD et al. reported that ultrasound exposure enables the capacity of liposomes to accumulate into the primary EMT tumors, stating the usage of nanotechnology for drug-delivery enhancement. Even if advantages offered by nanomedicine are widely scrutinized and the vast majority of experiments ongoing worldwide are presenting appealing possible utilizations, eventual negative effects should be also taken into consideration. Recently, Choo WH et al. established that silver nanoparticles, following 4 months of administration to human bronchial epithelial cells, exhibited migratory phenotype, invasiveness and anti-apoptotic genetic changes. Moreover, EMT occurred as reflected by down-regulation of E-Cadherin and up-regulation of N-Cadherin and Vimentin. Stating that chronic exposure to silver nanoparticles may induce malignant transformation to bronchial epithelial cells, the study suggests that this could be the potential risk of long time exposure by inhalation. In a similar manner, malignant cells should be tested for acquiring metastatic properties following nanoparticles administration and research should be extended on other materials. It would be a proper research direction for all the classes of structures that have been proven their effectiveness in primary tumor teragnostics to be investigated. The risk of metastatic transformation of the remnant primary tumor cells following therapeutic or diagnostic nanoparticulate exposure could impose new research strategies for medium and long term testing. Tant S et al. designed novel nanoparticles based on amphiphilic polymers in order to achieve simultaneously delivery of Snail specific siRNA and Twist specific siRNA and also paclitaxel to improve its biodistribution and concentration. It was reported the successfully tumor growth inhibition on breast cancer-mice models and the capacity of the system to inhibit almost completely lung metastasis formation. While single siRNA delivery exhibited only modest results, delivery of the two types of siRNA revealed promising results, shedding light on the importance of multi-targeting for EMT reversal. Shen J et al. have emphasized that co-delivery of paclitaxel and small hairpin RNA in order to silence Twist transcription factor in a complex nanoformulation based on pluronic copolymers reached in situ tumor growth inhibition and were also effective against secondary tumor. Breast cancer mice model with lungs metastases has been used in order to achieve the aim and, at the endpoint of the study, lungs seemed to be clear. Moreover, reversing EMT may contribute to augmentation of the sensibility of malignant cells to paclitaxel. The nano-delivery system proposed proved its efficiency for adequate nucleic acid delivery, increased the solubility of paclitaxel, provided sustained release of the drug. Consequently, the structure may eventually be used as a valuable agent in breast carcinoma by utilization of Twist down-regulation strategy. Although the research was focused on metastasis treatment, such strategy could also prove useful in prevention of further metastasis formation. Still underestimated and underevaluated, intrinsic properties of nanoparticles may be bridging some gaps between immediate and long-term anti-metastatic effects. Arvizo RR et al. have reported, that pristine gold nanoparticles (GNPs) are able to inhibit MAPK pathway. Data resulted from in vitro and in vivo (ovarian carcinoma model) testing, it was emphasized the capacity of GNPs to delay tumoral and metastases growth by reversing EMT, in a size and concentration- dependent manner. GNPs down-regulated Snail, had no effect on Twist and thus up-regulated E-cadherin. Vimentin and N-cadherin were suppressed, thus strengthening the obtained evidences. Pancreatic cancer and complexity of physiopathogenetic pathways involved in EMT process as fundament for carcinogenetic transformation. Interaction of CAF, cytokines, growth factors, integrins and dynamics of the process. Reproduced after Gaianigo et al. 2017, with permission . Further investigations regarding ovarian carcinoma and EMT reversal suggested that in vitro administration of miR-101 inhibited invasion and migration features following ZEB1 and ZEB2 suppression . Although in vivo results are still needed, the last two findings may be the groundwork for assessing the result of combining the inner effect of GNPs and targeted inhibition of ZEB1 and ZEB2 for ovarian carcinoma. Colorectal cancer is also a candidate for EMT reversal therapy by specific delivery of Snail siRNA. Recently, Sadreddini S et al. have reported effective co-delivery of doxorubicin and siRNA against Snail loaded into chitosan-based nanoparticles. In vivo experiments conducted exhibited encouraging results, reaching proper apoptosis activation and migration inhibition, with E-Cadherin, vimentin and matrix metalloproteinases normalization. Further in vivo studies should be performed. Kaushik NK et al. reported the exposure of glioblastoma cells and also of mice bearing xenografts to PEG-coated GNPs and cold plasma. EMT reversal suggested by Slug and ZEB-1 down-regulation resulted in tumor growth inhibition in vivo. Furthermore, several other markers were assessed and one relevant finding was the reducing in CD133+ cells following therapy, a marker for cancer stem cells. The major pathway through which simultaneously administration of GNPs and cold plasma is able to delay tumor growth and prevent metastasis is PISK/AKT inhibition. A comprehensive analyze on migratory capacity of stem cells, along with stem cell subsets was published by Nguyen as illustrated in Figure 3 . TGF-β presents a dual role in tumorigenesis. During the early stages it assures protective effects through apoptosis induction. Conversely, during later phases, TGF-β has a strong effect of enabling EMT thus leading to the progression of cancer. The signaling pathway involved in TGF-β- induced EMT implicates a cluster of genes, transcription factors and effectors regulating a multitude of signaling pathways. The underlying mechanism is still insufficiently known. However, the most frequently observed event is activation of Smad family transcription factors following specific interaction of TGF-β with its receptor. The mechanisms are further causing up-regulation of transcription factors responsible of E-cadherin loss. Moreover, interactions with platelet derived growth factor and with Notch had been established [35, 36, 37]. In addition, Liu J et al. observed that inhibition of TGF-β improved biodistribution of nanoparticles in breast carcinoma by normalizing the tumor stroma. Strengthening the results, Zuo ZQ et al. provided evidence that administration of a TGF-β inhibitor previously siRNA specific for PLK1 nano-delivery system administration, enhanced local distribution of nano-agents on mice bearing breast cancer xenografts. Moreover, the system was able to delay tumor growth and diminish cancer stem cells population. In comparison, delivering the mentioned nanoagent without pre-treatment and TGF-β specific inhibition, cancer stem cells localized in the residual malignant tissue exhibited notable proliferation. It is strengthened the role of this pathway in tumoral progression and the real need of blockage to prevent expansion of malignant mass. Cancer stem cells and their ability to become metastasis- propagator cells. Subpopulation separation due to occurrence to different oncogenic changes. Clonal phenotypic properties are different in terms of location or drug resistance for future metastatic process. Reproduced by Don, 2011, with permission . Liu Y et al  provided evidence on intrinsic antitumoral effect of metallofullerenol nanoparticles containing gadolinium on breast cancer cells by reversing EMT following TGF-β inhibition. The results are confirmed by in vivo reduction of pulmonary and hepatic micrometastases. Moreover, the nanoparticles exhibited also hypoxia inducible factor-1α (HIF-1α) inhibition and thus, decreased cancer stem cells population. HIF-1α also represents a key mediator of angiogenesis, due to its role to induce expression of vascular endothelial growth factor (VEGF). Metallofullerenol nanoparticles may be further evaluated for their antiangiogenic effect and for their ability to restore epithelial function and decrease cancer stem cells, as they may represent useful tools for multi-pathway inhibition. Hepatocelullar carcinoma is also a type of cancer having strong dependence on TGF-β induced EMT . Wu J et al. proposed GNPs for delivery of specific TGF-β1 siRNA. The nano-system provided effective outcome, reaching significant apoptosis of HepG2 cells in which TGF-β1 was successfully silenced. In vivo findings were consistent with those obtained by in vitro testing. Tumor growth inhibition in a HepG2 mouse-model was achieved. EMT was not discussed, but further research may be still required to make a step further in the relationship between hepatocellular carcinoma, EMT reversal and metastasis prevention. Fank JK et al. designed chitosan modified nanoparticles payloaded with TGF-β siRNA which provided beneficial evidence of liver metastasis inhibition on a colorectal cancer mouse model. One of the subsequent mechanisms is represented by reduction of tumor associated macrophages, highlighting the role played by TGF-β in local immune environment. Liposomal-based nanoformulation was used by Park J et al. for co-delivery of TGF-β inhibitor and IL-2 as treatment strategy for melanoma with liver metastases. The nano-system was designed to block the cytokine in order to restore local immunity and facilitate IL-2 activity. By restoring the number and activity of natural killer cells, it may be used as potent tool for metastatic disease treatment. As it is suggested, TGF-β resides at a crossroad between EMT transition and immunity, a link which should be strengthened in future. Kim H et al. emphasized the need of standard designs of testing the nanoparticles, especially considering the natural environment. They reported that titanium dioxide nanoparticles underwent reproductive toxicity on nematode Caenorhabditis elegans. The subsequent mechanism was TGF-β activation. Yu Y et al. exposed intravenously ICR mice to silica nanoparticles and reported the occurrence of high oxidative stress level, intensified apoptosis and fibrosis in liver, promoted by TGF-β. These finding may suggest a potential side effect of chronic exposure of this type of nanomaterial. EGF has tremendous functions in cell homeostasis, controlling mechanisms as migration, proliferation and apoptosis. Its receptor with tyrosin kinase activity is activated by several ligands (EGF, heparin-binding-EGF, TGF-α, leading to autophosphorilation and consequent activation of several pathways: ras/MAPK, PI3K/AKT, STAT, PKC/NF-Kb. The ligands are anchored by cellular membrane wherefrom are settled free by metalloproteinases (ADAMs family), also involved in extracellular matrix modulation [47, 48]. According to the literature, epidermal growth factor receptor (EGFR) is overexpressed in acute and chronic cell injuries, having the role to enhance regeneration , . On a background of chronic injury, malignant transformation may arise, thus EGFR is frequent overexpressed, leading to exacerbated proliferation and migration, with poor cellular differentiation. Grände M et al. reported the effect of EGF and TGF-β co-stimulation on pig thyrocites, as these growth factors seem to induce loss of epithelial morphology and fibroblast-like phenotype. Interestingly, independent stimulation was ineffective. Furthermore, Lee MY et al. provided evidence that EGF stimulation led to increased cell invasivity and loss of epithelial features in cervical squamous cell carcinoma by complex interaction with Snal, integrins and fibronectin. The role of Twist was also reported . Buck E et al. suggested that association between EGFR inhibitors and EMT-reversal agents may be of particular importance in patients with resistance to EGFR inhibitors, proving that mesenchymal phenotype and drug resistance are in strong correlation. Thereby, EGFR-mediated pathway is a promising target for precocious intervention in cancer and metastasis by EMT reversal. Nanomedicine may provide the needed agents, especially because it offers the possibility of co-targeting. Balakrishnan S et al. reported the usage of GNPs functionalized with quercetin as treatment strategy for breast cancer. 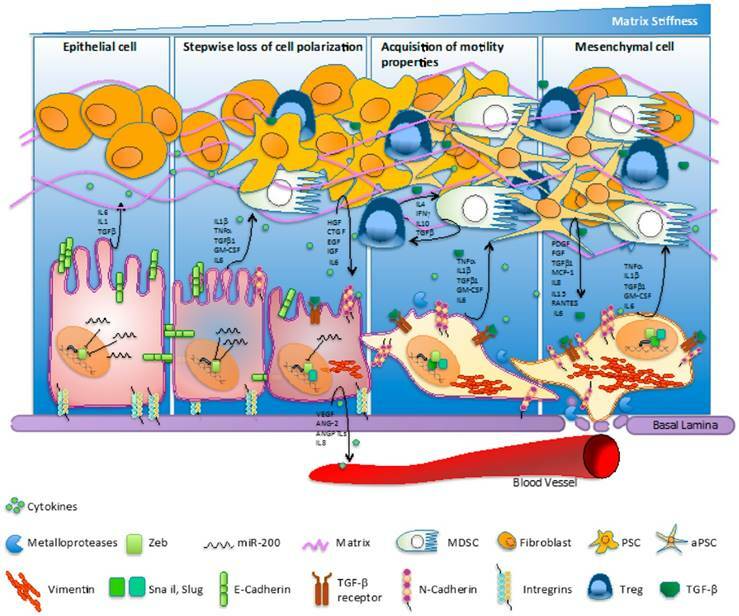 It revealed the potency of the proposed agents to restore epithelial markers (E-cadherin), with concomitant down-regulation of mesenchymal ones. Furthermore, beyond EMT reversal, angiogenesis was also suppressed. Results are also promising in vivo, whilst it inhibited metastasis formation. The underlying mechanism was EGFR/VEGFR-2 blockage. Research regarding the usage of nanotools in EMT and proliferation/migration features are still scarce, even if targeting EGFR is widely studied under several different proposals: nanophotothermalysis , drug-delivery , molecular therapy , theranostic . VEGF lies at the crossroad between EMT and angiogenesis, playing significant role in both of the tumoral mechanisms. For this reason, dissociated approach is inconvenient. Moreover, data regarding the potential of VEGF to promote EMT and the pathways involved is not yet completely elucidated. It was shown that mesenchymal phenotype of pancreatic  and breast cancer  cells induced by VEGF is due to up-regulation of Snail, Twist and Slug. Another recent finding suggests that the tumorigenicity after EMT is dependent on VEGF up-regulation and that VEGF is important for angiogenesis in breast cancer in vivo . A tumoral mass is deprived by blood supply when it reaches a particular dimension for which the blood vessels are insufficient and thus leading to limitation of growth. The angiogenic profile of the tumor is the result of an imbalance between pro and antiangiogenic factors dictated by genetic or local changes- such as hypoxia, often reflected by local overexpression of several proteins. When local factors, which are favoring angiogenesis are predominant, the tumor undergoes the so called “angiogenic switch” [63, 64]. VEGF plays a key role in neovascularization by direct or indirect mechanisms. It is involved in direct activation of endothelial cells. Thereupon, the cells migrate, proliferate, and undergo a maturation phase for novel vessel organization . It has also been emphasized that performing sustained release of VEGF by PLGA nanoparticles enhances vascular bed extension on mouse with lower limb ischemia, minimizing side effects of free VEGF administration and thus, strengthening its role . Moreover, VEGF promotes transmigration of malignant cells through novel formed vessels, with negative consequences on prognosis . Newly formed capillary vessels represent alternative routes for malignant cells to facilitate their entrance into the blood stream whereby they form emboli, adhere to blood vessels wall and then extravagate into the parenchyma where proliferation and capillary neoformation are once again needed to increase the metastatic mass . Tumoral expansion is dependent not only on the blood supply itself, but also on the factors secreted by recently formed endothelial cells initiating a paracrine response [68, 69]. One powerful feature established is that angiogenesis may occur as an early event in tumor progression and it may arise before invasion step in mice . Early occurrence of angiogenesis has been reported for skin cancers , lymphomas . Thereby, one of the strategies in early cancer treatment is represented by angiogenesis inhibition directly or indirectly. Its pathway provides several specific targets, such as VEGF, epidermal growth factor-EGF, platelet derivated growth factor (PDGF), fibroblast growth factor- (FGF), tirosin kinase receptors and transcription factors (HIF). Antiangiogenic therapy is currently canvassed worldwide as reflected by the significant number of ongoing clinical trials. A few drugs targeting especially VEGF pathway are approved for the treatment of some types of both primary and secondary malignancies and meant to disrupt the presented events. Bevacizumab, sorafenib, sunitinib, everolimus and pozapanib are successfully used alone or in different combinations with other therapies. VEGF pathway inhibition may be successfully achieved by selective gene silencing. siRNA are promising candidates but there are a few biological barriers to be overcome. The intracellular uptake is limited, they may lack blood stability because of RNase activity and may initiate non-specific immune activation. Nanotechnology appears to be suitable for effective delivery of siRNA. Li SD et al. used liposomal-based formulation for systemically administration of siRNA in order to achieve VEGF, c-myc and MDM2 silencing. The strategy to suppress lung metastases formation following B16F10 cells administration is to perform simultaneously arrest of cell cycle progression, apoptosis and angiogenesis pathways. As the researchers reported, metastases development was significantly reduced, revealing a possible approach also for effective delivery of siRNA and for treating lung metastases. Pittella F et al. proposed calcium phosphate based nanoparticles which provide highly biocompatibility and reported that delivery of siRNA to silent VEGF was capable to enhance pancreatic tumor growth inhibition. Calcium phosphate nanoparticles may be further tested to assess their eventual contribution to metastatic pancreatic cancer, in particular because there is a growing interest to investigate novel therapies for pancreatic cancer because of its 5 year survival rate around 2%. As nanomedicine seem to provide effective tools to inhibit angiogenesis via VEGF down regulation, the link between these agents and EMT should be established to assess the potential as early phase treatment. Although growth factors exert a well-defined role, they also integrate in the complex interaction between growth factors, cytokines, EMT and MAT changes. Such inter-connections are described by Katarzyna et al, as illustrated in Figure 4 . Integrins are known to be appealing targets for primary and secondary tumor treatment, being implied in elaborated pathways and bridge gaps between several processes. Integrins are transmembrane receptors composed by two subunits- α and β which modulates interaction between cell and extracellular matrix, active in cellular homeostasis, proliferation, migration and survival. In cancer progression, there is a strong need of local selection of pro-cancerous integrins, while those with protective role are subsequently down-regulated . It was reported that integrins and TGF-β are in intimate connection, especially αv integrins, by interaction with Arg-Gly-Asp (RGD) and thus leading to TGF-β1 and TGF-β2 activation. Moreover, it had been reported that αv integrins inhibition promotes reversing of EMT induced by TGF-β . EMT and MAT involve complex signaling between cancer cells and hepatocytes. Involvemement of VEGF, PDGF, MMPs, TGFβ represent key factors in modulation the effect. Reproduced by Katarzyna, 2015, with permission . Β3 integrin silencing was achieved by delivery of specific siRNA via lipid-based nanoparticles, functionalized to bind to αvβ3 integrin, in order to enhance cellular uptake. The novel design of nano-system was assessed for its efficiency in vivo, after a triple-negative breast cell line treated with TGF-β was engrafted in mice. Parvani JG et al. observed that the primary tumor was significantly reduced and inhibition of metastases was also achieved. The underlying mechanism was specific down-regulation of β3 integrin and also TGF-β inhibition, which conducted to EMT reversal. Gold nanorods are reported to play significant role in photothermal therapy by several researcher groups . Ali MRK et al. exposed human oral squamous cell carcinoma cells to gold nanorods functionalized with RGD as strategy for targeting integrins. Further, photothermolysis was achieved by near infrared light. One major finding was inhibition of cell motility. It was reported that cellular morphology changed following treatment, by fewer lamellipodia and filopodia observed. Targeting integrins and phototherapy is thus a strategy of utmost importance, able to provide downregulation of integrin effectors (Src, ERK 1/2) and through this stabilizing the tumor mass in epithelial state (N-cadherin augmentation). Albumin nanoparticles conjugated with RGD were reported to undergo successfully receptor-mediated internalization in pancreatic cancer cells and achieved in vitro and in vivo promising results. Furthermore, the capacity to potentiate gemcitabine effect was emphasized . The cross-talking with EGFR, PDGFR, VEGFR has been shown as means of gaining migratory characteristics , suggesting the need of multi-directional targeting. An important contribution is during angiogenesis. VEGF, TGF-α, FGF, tumor necrosis α (TNF-α) have been reported to activate some integrins and thus promote angiogenesis. Several researchers proposed multifarious nanoparticles for metastatic cancer treatment. Murphy EA et al. designed liposomes payloaded with doxorubicin to achieve angiogenesis suppression in a targeted-fashion and set up in vitro and also in vivo experiments on orthotropic pancreatic cancer and renal cell carcinoma mice models. The nanosystem exhibited preferential accumulation into tumoral mass with minimal or absent accumulation in other organs. Regarding metastasis, it was achieved a significant growth inhibition compared to the primary tumor in which apoptosis was induced only on cells expressing β3. Moreover, metastases incidence was decreased. In order to obtain similar response, it was needed a dose of free doxorubicin 15 times greater, suggesting the importance of targeted delivery on the usage of smaller amounts of drugs and thus minimizing adverse effects. The preferential outcome for metastasis growth inhibition is incompletely elucidated but it suggests the importance of maintaining an adequate blood perfusion of the primary tumor to gain invasiveness and systemic dissemination capacity. It may lead also to the conclusion that different integrins are expressed preferentially in the primary tumor or in metastatic sites. The laminin receptor, part of integrin family, has been exploited by Sarfati G et al. , who functionalized Estapor® nanoparticles with Tyr-Ile-Gly-Ser-Arg peptide, which has the intrinsic capacity to inhibit tumor growth. The nanosystem was tested on lung metastatic mice and exhibited preferential accumulation both into the primary tumor (melanoma) and into secondary masses, with no tropism for other organs. Moreover, the healthy lung tissue did not capture nanoparticles, suggesting the selectivity of the approach and the potential of reducing side effects. The authors hypothesized that the system may be successfully tested as drug delivery agent, providing evidence for the key role of laminin receptor. Pathways of metastasis development. Transformation between dormancy and migratory state of cells can be modulated by multiple factors. Reproduced by Sleeman et al, 2011, with permission . The last two examples provide auspicious approaches. It might be interesting to test epithelial and mesenchymal markers for the two nano-formulations to establish a potential new link between angiogenesis and EMT. Another direction would be the improvement of the proposed therapy by functionalizing against specific target in order to reverse EMT. In the management of the oncologic patient, assessing adequate imaging techniques are of highly importance. There is a strong need of improving the existing methods regarding resolution and signal/noise ration to provide early detection or to develop novel ones. Peiris PM et al. reported an effective method for imagining liver and lung metastasis on orthotopic breast cancer mice model, non-invasively, using iron oxide nanochains targeting integrin αvβ3 and thus giving a direction for improving micro-metastasis imaging, which detection represents a major challenge nowadays and dictates further therapeutic attitude. 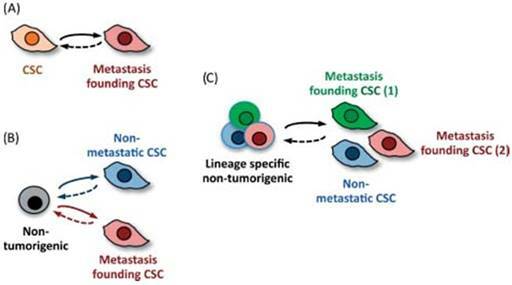 Also, the sole progression of a tumor towards metastatic process should also be understood in the context of whole body regulation, involving transformations coming from cell-to cell communication, signaling molecules and transitions of cells from dormant to active, migratory cells, as illustrated in Figure 5 . There is an increase interest and need in the development of novel therapies for oncologic patients. Prevention of systemic dissemination for malignant cells represents a consistent aim, the event being responsible for guiding the clinical management of the case. The rational possibilities of blocking the entire invasion process and restoring the normal homeostasis make the early steps of the cascade the most appealing target-search domain. Nanotechnology offers hopeful tools to encounter the cross-talking pathways and its effectiveness has been demonstrated by several in vivo and in vitro experiments. Although targeting EMT is still under evaluation, this elaborate event occurring in tumor progression could serve as a therapeutic target-source. The link to angiogenesis could shed light on different opportunities for simultaneous targeting and improved outcome. Although side effects of different nanocarriers on both healthy and primary tumor cells still need intensive research, all reviewed data suggest nanotechnology is a promising tool for modulation, counteracting and efficiently treating the metastatic process and masses. The authors wish to acknowledge financial support from the “Iuliu Hatieganu” University of Medicine and Pharmacy, Cluj-Napoca, Romania, grant contract no.4995/13/08.03.2016. This work was also supported by the Romanian National Authority for Scientific Research and Innovation, CNCS-UEFISCDI, project numbers PN-III-P1-1.1-TE-2016-2161, PN-III-P2-2.1-PED-2016 1742 and PN-III-P2-2.1-BG-2016-0446. 21. Anonymous. Proceedings of the Seminars in Cell & Developmental Biology: Elsevier; 2010. Corresponding author: Lucian Mocan 3rd Surgery Clinic, “Iuliu Hatieganu” University of Medicine and Pharmacy, 19-21 Croitorilor Street, Cluj-Napoca, Romania Tel +40 264 439696 Fax +40 264 439696, Email: mocanluciancom, lucian.mocanro.